AmazonLocal, Amazon’s daily deal website along the lines of Groupon has an amazing AmazonLocal Gift Card Deal for everyone – a $10 Amazon.com gift card for $5. Lat year Amazon had come up with a similar deal ($20 Amazon.com gift card for $10) through LivingSocial which it had invest in earlier. The AmazonLocal gift card does not have an expiration date which means if you shop on Amazon.com regularly then this $5 OFF coupon is a great way to shop next time you decide to buy something on Amazon. The deal expires on March 20th midnight Pacific Standard Time USA. As of March 20th, (1:pm PST), the deal had been purchased by people 826,673 which is a huge number for a daily deal. The daily deal initiatve of Amazon is a relatively new venture for the company that has diversified very well with Kindle tablets, Elastic Cloud services (S3/AWS) and other ideas that have become inflection points in the technology industry. The success of AmazonLocal is yet to fructify as it is in the early stage of accumulating loyal consumers, but the Amazon brand should give it a major boost, especially as it adds more products and services around the AmazonLocal product. The offer itself can be used for a long period of time. Although an expiration date is usually attached to it, you have to option of using it at your convenience. 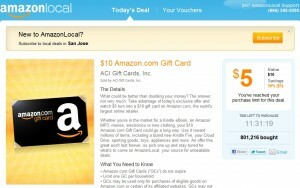 Did You buy the AmazonLocal Gift Card Deal? Do you plan on buying the AmazonLocal Gift Card Deal? If so, how do you plan on using it. Will you be coming back to AmazonLocal after today? Share your thoughts with our readers in the Comments below.